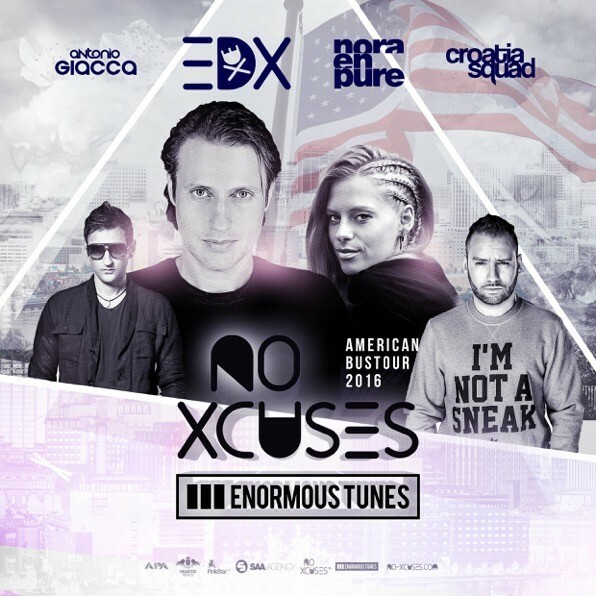 EDX recently announced the No Xcuses Vs Enormous Tunes Bus Tour that will hit major cities across the U.S. and Canada, starting in February and running through March 2016. On the back of a year that included world tours, apparently several huge hits, including ‘Belong’ and his ‘Show Me Love’ remix, No Xcuses events, and more, EDX gets ready to take on the new year with a family-oriented bus tour, in addition to more studio productions. For the first time ever, EDX's radio show and event brand, No Xcuses, is joining forces with the label, Enormous Tunes, to attempt to showcase their standing within dance music. Featuring a lineup including EDX, Nora En Pure, Croatia Squad and Antonio Giacca, along with additional guests from the No Xcuses and Enormous Tunes family, the bus tour aims to demonstrate sets from each of the artists through a diverse array of house music. The bus tour will be a platform for not only EDX, but also the squad of burgeoning artists who may well deserve their own time in the spotlight.